For other people named John Goodricke, see John Goodricke (disambiguation). John Goodricke, named after his great grandfather Sir John Goodricke 1617–1670 (see Goodricke baronets of Ribston Hall), was born in Groningen in the Netherlands, but lived most of his life in England. He became deaf in early childhood due to a severe illness. His parents sent him to Thomas Braidwood's Academy, a school for deaf pupils in Edinburgh, and in 1778 to the Warrington Academy. After leaving Warrington, Goodricke returned to live with his parents in York. There, he became friends with his neighbour Edward Pigott, whose father Nathaniel Pigott had built a sophisticated private observatory. Edward was already interested in variable stars, and he gave Goodricke a list of those that he thought were worthy of observation. Goodricke is credited with discovering the periodic variation of δ Cephei, the prototypical example of the Cepheid variable stars. Although several stars were already known to vary in apparent magnitude, Goodricke was the first to propose a mechanism to account for this. He suggested that Algol is what is now known as an eclipsing binary. He presented his findings to the Royal Society in May 1783, and for this work, the Society awarded him the Copley Medal for that year. He was elected a Fellow of the Royal Society on 16 April 1786. He never learned of this honour however, as he died four days later from pneumonia. He never married. Goodricke was buried at Hunsingore Church in Yorkshire, along with many of his relatives. Today there is a marker in York near the site of John Goodricke's observatory. Between October 2005 and March 2006 Sean Ellingham and James Valner from the University of York undertook a project to find the position of Goodricke's observatory using the data he recorded. A 1949 study by Sidney Melmore had shown that Goodricke worked from the Treasurer's House (now owned by the National Trust) very near York Minster. By re-creating Goodricke's observations, the two York students were able to conclude that he had observed from the eastern-most window of the second floor, looking south towards the Minster. He is buried with his grandparents, parents, brother, and nephew in the churchyard at Hunsingore, North Yorkshire. At present, the only stone marking their burial places says "The Goodricke Vault." Goodricke College at the University of York is named after Goodricke. There is also a modern sculpture named Algol in the grounds. Asteroid 3116 Goodricke is named for John Goodricke. The University of York has a Goodricke College named after John Goodricke. The Goodricke-Pigott Observatory is a private astronomical observatory in Tucson, Arizona, named after the two late-eighteenth century astronomers and friends who lived in York, England, John Goodricke and Edward Pigott. It was formally dedicated on 26 October 1996, and observations began that evening with imaging of Comet Hale–Bopp. In 2012 a non-profit organisation named after John Goodricke was established in Armenia by a group of amateur astronomers. In 1984 a planetarium show about John Goodricke was created specifically for deaf students by the HOSS Planetarium. ^ BBC News Magazine (18 December 2012). 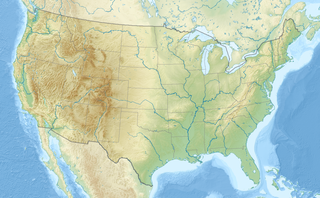 "Disability history month: John Goodricke the deaf astronomer". BBC. Retrieved 11 February 2013. ^ Goodricke, C. A. (1912). "Letter accompanying the gift to the Society of a portrait of John Goodricke". Monthly Notices of the Royal Astronomical Society. 73 (1): 3–4. Bibcode:1912MNRAS..73....3G. doi:10.1093/mnras/73.1.1. ^ Melmore, Sydney (1949). "The Site of John Goodricke's Observatory". The Observatory. 65: 95–99. Bibcode:1949Obs....69...95M. Gilman, Carolyn (1978). "John Goodricke and His Variable Stars". Sky and Telescope. 56 (11): 400–403. Bibcode:1978S&T....56..400G. Goodricke, John (1784). "On the Periods of the Changes of Light in the Star Algol. In a Letter from John Goodricke, Esq. to the Rev. Anthony Shepherd, D.D.F.R.S. Professor of Astronomy at Cambridge". Philosophical Transactions of the Royal Society of London. 74 (0): 287–292. doi:10.1098/rstl.1784.0023. Goodricke, John; Englefield, H. C. (1785). "Observations of a New Variable Star. By John Goodricke, Esq. ; Communicated by Sir H. C. Englefield, Bart. F. R. S. and A. S.". Philosophical Transactions of the Royal Society of London. 75 (0): 153–164. Bibcode:1785RSPT...75..153G. doi:10.1098/rstl.1785.0009. Goodricke, John (1786). "A Series of Observations on, and a Discovery of, the Period of the Variation of the Light of the Star Marked δ by Bayer, Near the Head of Cepheus. In a Letter from John Goodricke, Esq. to Nevil Maskelyne, D.D.F.R.S. and Astronomer Royal". Philosophical Transactions of the Royal Society of London. Printed by T.N. for J. Martyn and J. Allestyry, Printers to the Royal Society. 76 (0): 48–61. doi:10.1098/rstl.1786.0002. "Goodricke's life and astronomical work". Features animations of different types of variable stars. Goodricke, Michael. "John Goodricke". Retrieved 13 May 2009. Anda, Rune. "Goodricke's handwritten letters and tables of observations". Retrieved 12 January 2019. Features scans of his notes retrieved from the York City Archives and other biographical information. Website in Norwegian, scans in English. 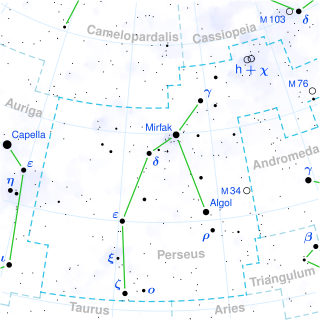 Algol, designated Beta Persei, known colloquially as the Demon Star, is a bright multiple star in the constellation of Perseus and one of the first non-nova variable stars to be discovered. Alpha Andromedae, also named Alpheratz, is located 97 light-years from the Sun and is the brightest star in the constellation of Andromeda. Located immediately northeast of the constellation of Pegasus, it is the upper left star of the Great Square of Pegasus. Delta Cephei is the Bayer designation for a quadruple star system located approximately 887 light-years away in the northern circumpolar constellation of Cepheus, the King. At this distance, the visual magnitude of the star is diminished by 0.23 as a result of extinction caused by gas and dust along the line of sight. It is the prototype of the Cepheid variable stars that undergo periodic changes in luminosity. 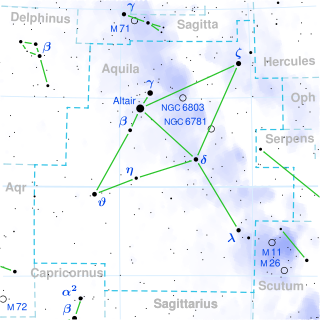 Eta Aquilae is the Bayer designation for a multiple star in the equatorial constellation of Aquila, the eagle. It was once part of the former constellation Antinous. On average, this star has an apparent visual magnitude of 3.87, making it one of the brighter members of Aquila. Based upon parallax measurements made during the Hipparcos mission, this star is located at a distance of roughly 1,382 light-years, although the parallax estimate has a 44% margin of error. The Goodricke-Pigott Observatory is a private astronomical observatory in Tucson, Arizona. It was formally dedicated on October 26, 1996, and observations began that evening with imaging of Comet Hale–Bopp. The Madras Observatory was an astronomical observatory which had its origins in a private observatory set up by William Petrie in 1786 and later moved and managed by the British East India Company from 1792 in Madras. The main purpose for establishing it was to assist in navigation and mapping by recording the latitude and maintaining time standards. In later years the observatory also made observations on stars and geomagnetism. The observatory ran from around 1792 to 1931 and a major work was the production of a comprehensive catalogue of stars. Fearon Fallows was an English astronomer. R Scuti is a star in the constellation of Scutum. It is a yellow supergiant and is a pulsating variable known as an RV Tauri variable. It was discovered in 1795 by Edward Pigott at a time when only a few variable stars were known to exist. Norman Robert Pogson, CIE was an English astronomer who worked in India at the Madras observatory. He discovered several minor planets and made observations on comets. He introduced a mathematical scale of stellar magnitudes with the ratio of two successive magnitudes being the fifth root of one hundred (~2.512) and referred to as Pogson's ratio.